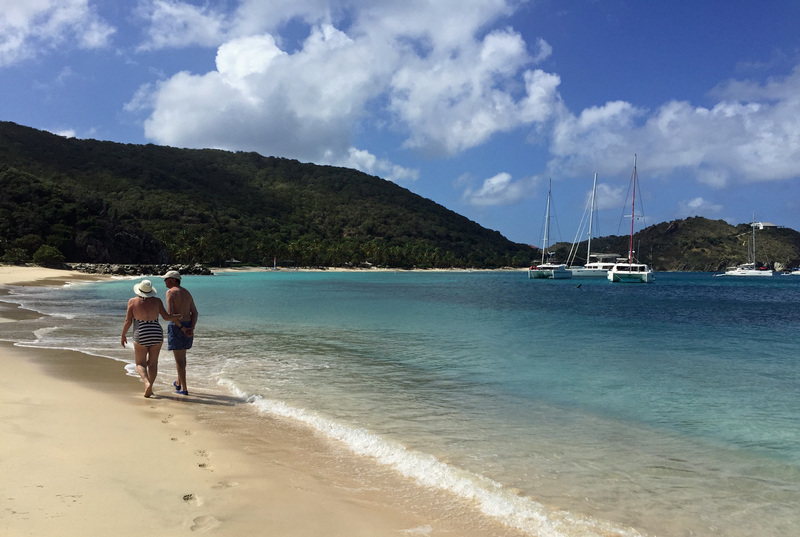 Our last stop is for a lunchtime swim and we anchor in a beautiful bay on Peter Island. There’s a smart resort here but they are gracious enough to let visiting yachtsmen use the beach and have lunch. Don’t pinch the loungers, mind. We don’t but we swim and spot a couple of sizeable iguanas on the beach. The sea is bright turquoise and the beach sand nearly white. We arrive back at the yacht’s base in Road Town, Tortola in late afternoon. On the way in we pass three large cruise liners disgorging their thousands of passengers onto the quay. There is a special development of small lock-up kiosks, designed purely to cater for the cruise passengers who want a few trinkets but don’t want to stray too far from the groaning buffet bars on board or mix with too many locals. 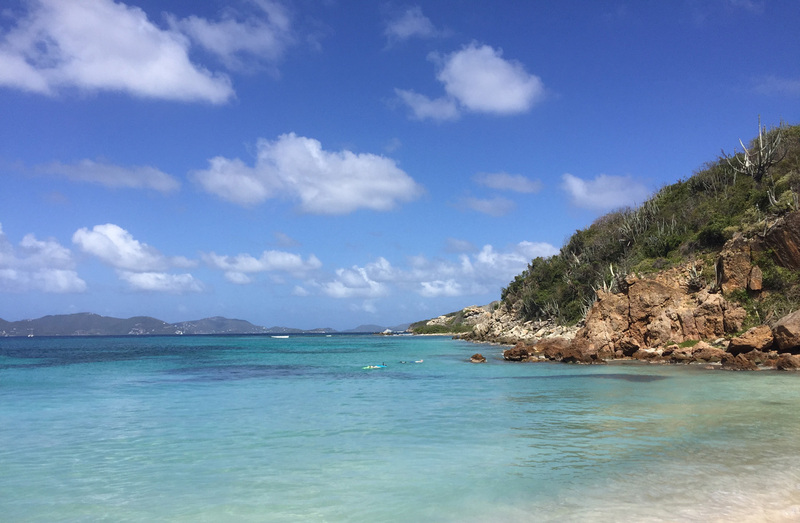 We even saw one ship anchored off Great Harbour on Jost Van Dyke, so Foxy’s Bar was probably doing a roaring trade. In quiet times they mix the cocktails by lining up three or four glasses and just running the rum bottle along, pouring continuously; goodness knows what they do when five hundred people descend. Dispense rum by hosepipe probably. Our Marina is a little out of town so for our eatery of choice we choose the local C&F, a West Indian/creole restaurant. Inexplicably the phone is out if order and we find it’s gone bust. Everyone is keen to help with a replacement and Mike, our taxi driver, takes us to a restaurant he favours. We walk in, and right out the other side to stroll towards the delights of Main Street. 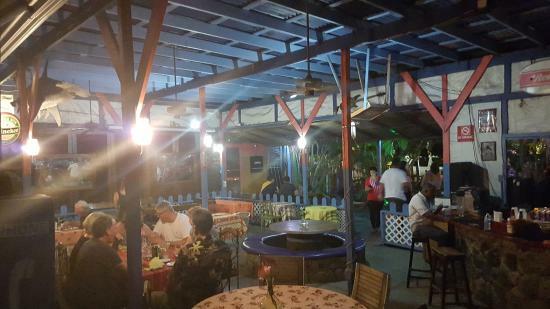 The cruise ships are just reclaiming their passengers (they wouldn’t eat ashore anyway – they’ve already paid full board on the ship) so we get a table at Le Cabernet and get stuck into Carib beer and Painkillers. They’re cheap but considerably stronger than previous examples. Very moreish. Despite booking a table indoors (though no doors were in evidence) we eat outside right by the busy and noisy street. Cars one side, reggae music the other. Our server takes things gently; he has to go and place the order for the two starters and then come back for the mains order. Despite the exaggerated care we get beef carpaccio instead of salmon to start – still nice, mind. Turning to the mains, we order four but he only remembers three. When they arrive he suggests an extra plate, which is just as well. One plate of pork would have fed a family of four for a fortnight. Speaking of fortnights we recall a series of client briefing meetings for a large hospital development. The team, a mixture of English and American architects met regularly. At the end of each meeting it was agreed to meet again in a fortnight. After four or five meetings one of the Americans said “what’s a fortnight”. He’d turned up nonetheless. We stroll back, in the back door of the taxi-recommended restaurant and out the front, to meet our waiting driver. All is well.